I know I saw a few episodes of this as a child, but I really can't remember any specifics. My assumption when we turned this on was that it was going to be painful - things from this era usually are, and I've burned by quite a few family-friendly comedies in the past. However, this one left me pleasantly surprised for the most part: two of the three episodes were pretty good. This episode from the series' first season revolves around Dennis's attempts to see his Christmas gifts early. Almost immediately, we're told that Dennis manages to find and examine his gifts early every year, which removes any sense of mystery. This year, his father's decided things will be different: rather than hiding Dennis's presents in their house, he brings them next door to Mr. Wilson's, who's more than happy to help thwart Dennis. But all this backfires when Dennis concocts a plan to locate his presents. Since his parents won't give him any hint as to their hiding place, he develops a Trojan horse strategy. For his father, he'd bought a fancy alarm clock that went off, paused, then went off again - sort of a auto-snooze feature. He tricks his mother into putting that with the other gifts, assuming he'd be able to follow the sound. But of course he's assuming the presents are in his house; he can't hear it from next door. Mr. Wilson, however, hears it perfectly fine. The alarm sounds like his doorbell, leading to a fairly predictable farce where he keeps trying to figure out why his doorbell keeps going off. Making the matter more complex, one of Dennis's other gifts was intended for Mr. Wilson's dog, who smells the bone and keeps trying to get at it. That's actually what tips Dennis off to the hiding place when he visits later. But even when he realizes where the gifts are stored, he can't get to them: Mr. Wilson blocks his path. So Dennis convinces his parents to invite the Wilsons over for Christmas Eve dinner. The night ends with the cast singing Silent Night, with the other characters dropping off until only Dennis is left singing. 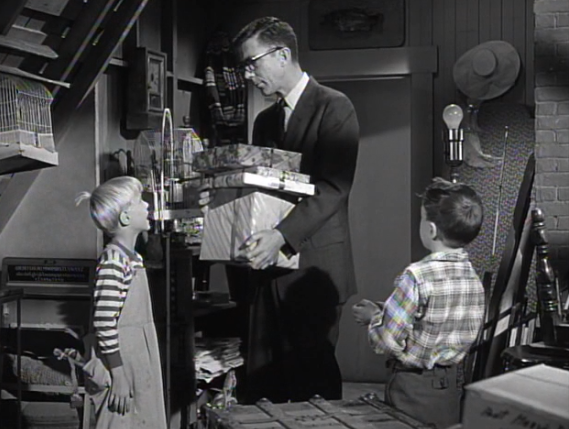 The scene is somewhat touching, and once Dennis runs off to bed, even Mr. Wilson admits the boy is really an angel. Cut to Dennis finding the sled and his other gifts, having used the opportunity to sneak into the Wilsons' house. As the episode closed, I was caught off-guard by how sharp the comedy was. I hadn't really expected to like this, but even the more contrived gags (i.e. : Mr. Wilson mistaking the alarm for a doorbell) were salvaged by some clever writing. I also loved that Dennis, while not exactly mean-spirited, definitely had a touch of mischievousness to him. They played that Silent Night moment straight then subverted it: that's admirable. The second Christmas episode was a weird one. Dennis is convinced that he's getting a horse for Christmas from Santa Claus: it's the one thing he wants more than anything else, and he's asked for it repeatedly. Even when Christmas morning comes and there's no horse under the tree, he remains hopeful, assuming Santa hid it or left it somewhere else. When he hears another boy got a horse, Dennis assumes it was some kind of mix up. Johnny, the son of wealthy man, actually got a pony, but that's close enough for Dennis. It turns out that Johnny doesn't want the animal, anyway: actually he's terrified of the thing. The gift was really just an attempt by his father, who had loved ponies as a child, to live vicariously through his son. Dennis gets Johnny to agree to trade his horse for what he really wanted: a typewriter. To get this, Dennis has to arrange a three-way trade, exchanging his record player for a typewriter and the typewriter for the pony. Of course, the adults are less keen on all this, and force the kids to trade everything back. Heartbroken, Dennis accepts a ride home on a horse-drawn carriage belonging to a Christmas tree salesman who's getting ready to retire. Dennis offers to buy his horse, and the owner shrewdly agrees, asking only five cents. Before they reach Dennis's home, he asks the boy a series of leading questions, until Dennis reaches the conclusion that the horse would be miserable in his garage. Within a few minutes, the salesman has gotten Dennis to rent him back the horse to graze in his field for the original nickle. As far as Dennis is concerned, he now owns the horse, even though it resides with its previous master. The episode wraps up with Dennis, his parents, and the Wilsons all taking a carriage ride with the salesman. In a callback to the prior year's episode, they all sing Silent Night, with the adults dropping off until it's just Dennis singing. There's no fake-out this time, but it's a sweet ending to a quirky and fun episode. This is the last Christmas episode of Dennis the Menace. While there was a fourth season, they didn't make another yuletide installment. Maybe that's for the best - this really wasn't up to par with what we'd seen before. Actually, it felt like an entirely different series. The driving force behind the first two holiday specials was Dennis's antics. You could look at him as a demon, troublesome boy, or a hyperactive child, but intentionally or not, he was the one making the mischief. Here, he's transformed into nothing more than an excitable boy. He's barely an agent in the story at all: he's just there to smile and crack the occasional (bad) joke. Instead, the plot is driven by Mr. Wilson, who is now obsessed with the nature of Dennis's childhood. He's horrified to see the small, painted tree Dennis's father bought and instead demands they return it and go to the woods to chop down a real one. When they get there, a series of mishaps occur, mostly due to Mr. Wilson's mistakes. First, the ax handle breaks, forcing them to cut the tree down with a tiny hatchet Dennis brought. Then Mr. Wilson's coat (along with his keys) fall down a well and are lost, forcing them to haul the tree back to the road and catch a bus, which results in scared passengers and a broken window. When they finally return with the fifteen-foot tall tree, it's of course too big to fit in the house. Mr. Wilson foolishly cuts off the top instead of the bottom, then winds up dismantling the tree until there's nothing left but a mangled mess. At the end, the store owner they returned the tree to at the beginning shows up to save Christmas. Yes, once again, capitalism saves the day. Of course, they tack on another rendition of Silent Night: no surprise there. I have no idea what happened to the show. Maybe this was just a weak episode, or perhaps the series faltered in its third season. Whatever the cause, the comedy felt watered down, and the moralizing came off as being in bad taste. The first two were fun and worth watching, but the final installment just isn't worth the effort.